Had a good time – 18th April. Saturday evening. Met 6 friends for early drinks at Woodside Inn. It was Happy Hours. Drinks included wine, white wine Sangria – it was the first time I had Sangria in white wine. I’ve always had it red, and surprisingly – white is far more pleasing as it is lighter in flavour. Then there was the Spiced Mojito and the Cosmopolitan. Oh. Not to forget the beers! We had all these and ordered some appetisers. Three appetisers and each one was really well-appreciated. Potato skins with mayo wasabi (RS. 245). 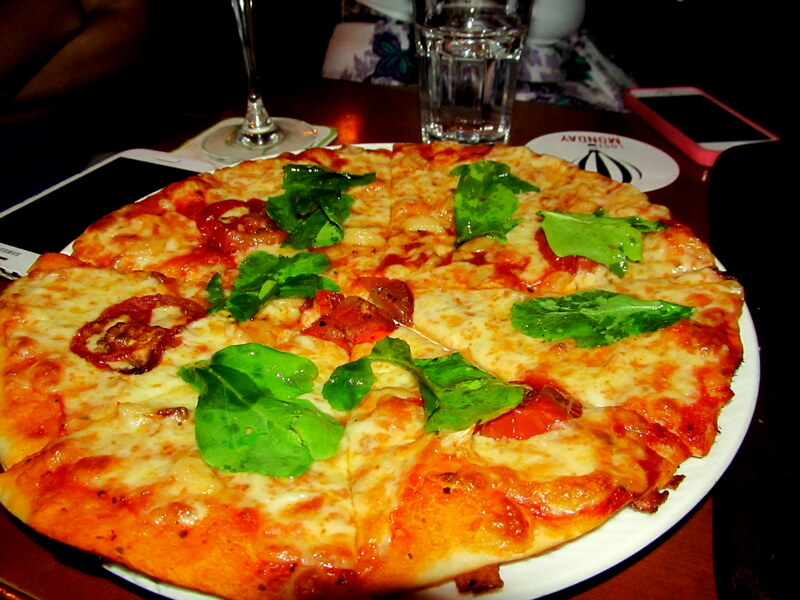 Pizza Margarita (Rs.395) and finally the Baked goat cheese bruschetta with tomato confit (Rs. 395). Ah! The bruschetta was fantastic. A nice layer of melted goat cheese on well toasted bread. The Pizza was lapped up immediately by each one of us. Everyone commented on the perfection of the pizza. I was lucky to get the photograph of the pizza as it was served last. The other 2 dishes came in at together and we just dived into them. 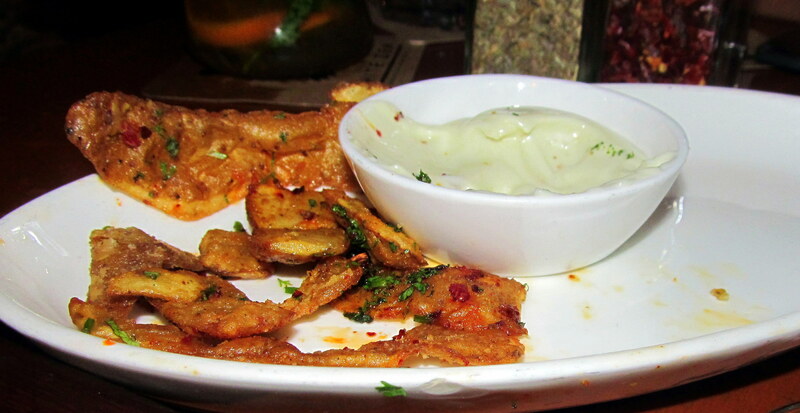 Hence, the below photograph of the potato skins doesn’t do complete justice to the dish. You can’t go wrong with potato skins. A good portion and with well-flavoured dip, made my evening. This entry was posted in Pizza, Restaurant Review and tagged beer, bruschetta, Colaba, Colaba Causeway, goat cheese, margarita, Pizza, potato skins, sangria, Woodside inn. Bookmark the permalink.